Graveheart: "Things might get rough!" Jade: "I was hoping you'd say that!" 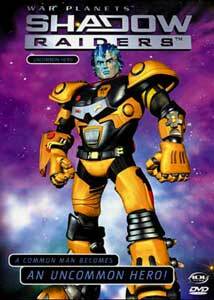 Shadow Raiders (aka War Planets) was the television follow-up to the popular ReBoot. The company that produced ReBoot (now called Mainframe Entertainment) decide to once again try to enter the world Saturday morning kiddie shows with something a bit more advanced. To be honest, I can't remember if this show was based on the War Planets toys, or if the toys were spawned from the show. Regardless, Shadow Raiders is a very impressive piece of work that makes huge advances in computer animated television. If you thought ReBoot looked good, Shadow Raiders is a visual feast. Presented on this disc are the first 4 episodes of the show. The first one, Behold The Beast, sets up the general plot. In a distant galaxy, Planet Tek is at war with the mysterious entity known as the Beast Planet, which absorbs other worlds. The energy based beings of the Beast Planet are not easily destroyed, and their numbers are vast. Planet Tek falls to the Beast Planet, but not before one surviving member of the Tek species, Tekla, manages to warp to another part of the universe. Her objective is to beat the Beast Planet to their destination and warn the planets she finds, hoping they'll be able to prepare and defend themselves. She encounters an unusual system comprised of four totally different planets: Rock, Ice, Fire, and Bone; each with its own distinct culture. Tekla's arrival interrupts a conflict between the people of Rock and the people of Ice, and, with the Beast Drones not far behind, King Cryo of Ice and a simple miner from planet Rock join forces to fight them off. Tekla is killed in the battle, but the miner, Graveheart, and King Cryo heed her warnings about the Beast Planet and set off to end centuries of war between the four worlds so they can band together against the Beast Drones. The immediate thing about the show is the astouding graphics. While, obviously, not the level of something you might see in the latest Hollywood blockbuster, the level of visual creativity and style is far above that seen in ReBoot. Each of the four worlds have a very distinct look and feel, with different creatures and cultural styles. The level of work done on this scale really pays off with, in my opinion, one of the most radical "kid" shows to ever air on television, in terms of what it shows. The texture mapping on the characters is a joy to look at, especially when the Rock people really look like rock, and the Fire people look like burning embers. The fine details are worthy of much praise, with even the smallest things rendered to perfection. Especially cool are the Beast Planet people; uniquely portrayed as clear with only a skull housed inside them. The story itself is pretty good, certainly not quite as dim as the average kiddie action show. Actually, I was surprised at the amount of death and doom in these 4 episodes. There's also a strong linearity, too; not a common thing in most kids entertainment. All of this results in a very fun, adventurous show that delivers plenty of action. It'd be interesting to see what Mainframe Entertainment could do with a movie-sized budget. Image Transfer Review: Other than some slight, occasional hazyness in a few textures and groups of color, the full frame transfer is crystal clear and digitally perfect. This is excellent, since it brings so much to the computer images in a flawless presentation. There are no complaints here. Audio Transfer Review: I was pleasantly surprised by the action and power of the Dolby 2.0 Surround audio. There's a whole lot of directional effects, mono surround channel activity, and a beefy low-end. It pretty much delivers everything you'd hope for from a sci-fi/action series. Dialogue and other sound effects elements are perfectly clear and audible. Crank up the home theater for this one. Extras Review: In the features department, the first up is a group of made-up bios for some of the characters in the series. Focusing on characters from Planet Rock, there is also some descriptions of their technology. I assume that volume 2 of this series will focus on Planet Fire, and so on. A reel of test renders is presented, with some simple camera sweeps into sets and world, along with character models in various layers of detail. Everything is wrapped up with trailers for other ADV releases, including the much anticipated Arc The Lad series. Shadow Raiders is good entertainment and certainly a wonderful treat on the eyes. Let's hope we see all 32 episodes head home. Highly recommended.